The world’s largest mobile network operator has completed development of a China Mobile Wallet running on an NFC version of the Coolpad 8870 smartphone and will begin shipping the device in the third quarter of 2012. 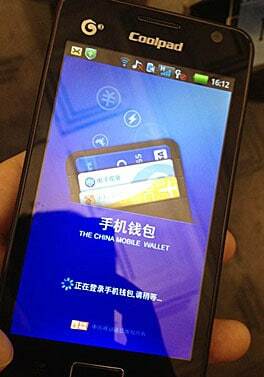 China Mobile is to launch its first full function NFC phone during the third quarter of 2012, the company has announced. The phone will be an NFC version of the Coolpad 8870, made by Chinese smartphone maker Yulong. The dual GSM/TD-SCDMA device conforms to China Mobile’s version of the W-CDMA (UMTS) 3G communications standard and will run a version of Android 2.3 Gingerbread. The Coolpad 8870 NFC will provide support for card emulation, tag read/write and peer-to-peer modes and will come with a China Mobile Wallet application. This, the carrier says, will allow users to load China Mobile co-branded cards and other services over-the-air. The co-branded cards will be issued via Shanghai Pudong Development Bank, in which China Mobile acquired a 20% stake in March 2010. Public transportation card, access control, membership and offers services are all being planned and users will also be able to use their NFC phone to read and top up the balance on their transportation card. The move follows the signing last month of a deal with payment network China UnionPay. This will see the two companies working together to promote NFC payments and on the development of NFC products and standards. Starting with pilot tests in several cities, the partners plan to gradually extend NFC payments services to one hundred Chinese metro areas.